Today is Mother's Day and children throughout the earth have an opportunity to remember and honor their mother. Besides these there are also several challengers who see the introduction of this "celebration" as a marketing event, or others who believe that the sanctity of a mother is such that it belongs to every day of the year and not just a special one. The Church displays the person of the Panagia as the mother par excellence and subtly commemorates the feast of the Presentation (February 2nd) as the day in which a mother is to be honored. Furthermore, in our tradition we encounter the very Church as a mother, who gives birth to us and regenerates us in Christ, leading us to salvation. 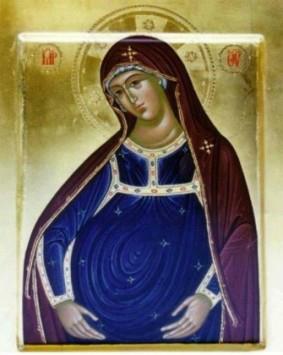 This does not mean, however, that there is some contradistinction: the wisdom and obedience of the Theotokos is considered the center of the Church. In her person we encounter the Mystery of the Divine Economy, says St. John of Damascus. And her free acceptance of God's will opened the path for humanities return to the divine embrace. The Incarnation of God the Word which took place in her womb, brought to reality the union of the divine with human. The Church, therefore, treads down history as a "continuous Theotokos" (Paul Evdokimov). The Panagia is an eternal model of a mother, who sympathizes and co-suffers with every person in pain and is both a shelter and comfort for all the persecuted. The sad icon of the sword that pierced her as she watched her Son suffer for humanity, makes her a person par excellence of compassion and philanthropy. She is the archtypal mother, aching and caring for her children for the grief and injustice which prevails in the world, continually sighing for suffering man. In her person mothers primarily find a unique assistant and absolute understanding in their concern for the future of their children and that of the whole world. In wars it is mothers who die, says the poet. For these reasons, the ecclesiastical proposal is to eminently honor the person of the mother.